A new biography about Tiger Woods is getting a lot of attention, mostly for its eye-opening anecdotes, including a particularly unflattering one describing a round featuring Woods and former President Bill Clinton. Now a former close advisor to the president who was present that day is pushing back hard against how that outing was characterized in the book. In a piece on Golfdigest.com (which last week published the excerpt in question), former Clinton counselor Doug Band vehemently disputes how the Woods-Clinton round is portrayed by the authors, Jeff Benedict and Armen Keteyian. The authors' account describes a rude and at times disrespectful Woods in respect to his interactions with Clinton, alleging that the two didn't get along and the round was little more than a forced photo-op. "The whole notion that Tiger was disrespectful toward the President is completely false," Band writes. "The way the authors describe the round of golf (and the events surrounding it) is not only inaccurate, it's mean-spirited." Band claims the outing was collegial and "they came to the game with respect for each other and left it with more." When asked about Band's conflicting account, Benedict and Keteyian told Golfdigest.com, "In reality, it's Band's letter that is inaccurate. Our sources for this account were three people with direct involvement in the events that transpired. Let us be clear: We stand by the accuracy of our reporting." Band also denies the biography's assertion that Woods spent most of the round riding in his own cart and talking on the phone rather than interacting with the president. 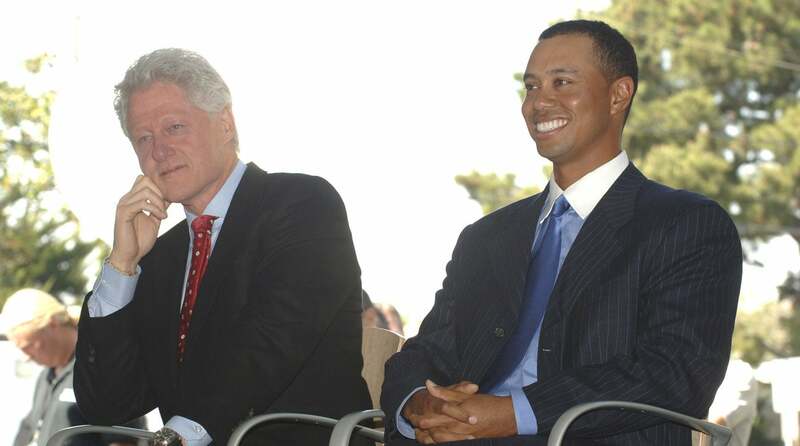 Instead, Band, who provided a photo of Clinton and Woods riding together during the round, writes, "Tiger and President Clinton shared a cart and were connected at the hip for most of the day. They also claim that Tiger was on his phone. Indeed, neither of which are true. I have dozens of pictures from that day and there is not one with Tiger on his phone or alone in his cart." Band acknowledges that the authors called him during the writing process to fact-check one Woods quote, but he says the authors never asked him about the general tone of the outing. "It was a positive experience in every possible way," Band wrote. "The authors found an unnamed source to turn the day into something 180 degrees away from what it actually was. Maybe that sells. Maybe that take fits the narrative they wanted to tell. But it's not truthful."